(Bloomberg) -- Thailand’s benchmark stock index fell less than most regional peers, while the currency strengthened as investors assess the outlook for the nation’s markets after a pro-military party took the lead in the first general election since a coup in 2014. 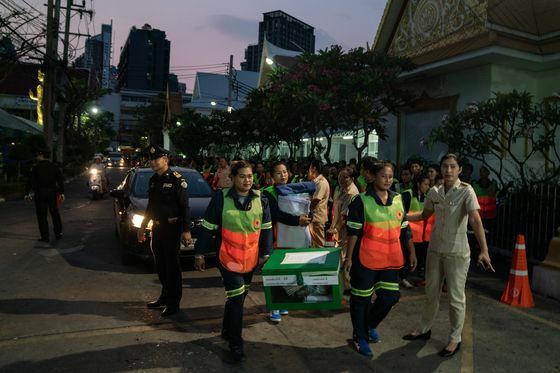 The Palang Pracharath party is now poised to bring junta leader Prayuth Chan-Ocha back as prime minister even as anti-junta parties led by Pheu Thai are also set for substantial lower-house seats. The outcome will prompt a review of exposure to Thai assets as foreign investors have withdrawn in excess of a net $700 million from its stock and bond markets this year. Thailand’s SET Index lost 1.3 percent as of 3:05 p.m. in Bangkok, less than declines in the broader Asian benchmark amid a global sell-off triggered by economic growth concerns. The measure extended drops as trading resumed after the lunch break. The baht, Asia’s best performing currency this year, strengthened 0.4 percent to 38.566 against the U.S. dollar, while the 10-year sovereign bond fell 2 basis points to 2.41 percent. 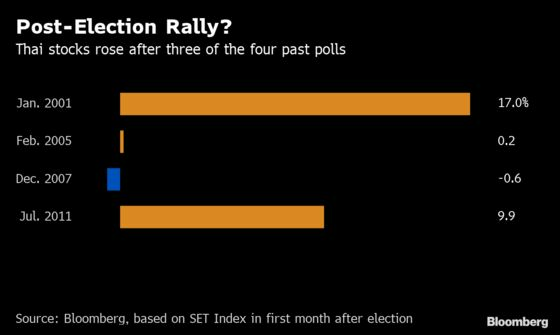 Thailand’s SET Index has gained an average 6.6 percent in the month after four major polls dating back to 2001, according to data compiled by Bloomberg. The gauge has climbed about 4.5 percent this year, trailing a 7.8 percent advance in the MSCI Asia Pacific Index. So far this year, international investors have withdrawn a net $349 million from equities after a record selloff of $8.9 billion in 2018.